A real pleasure today to bring my Dad Joe to the local (The Wishing Well) for a pint. He does not come to Dublin that often these days - normally it is usually me going down to Carnew or Kildavin to have a pint with him. 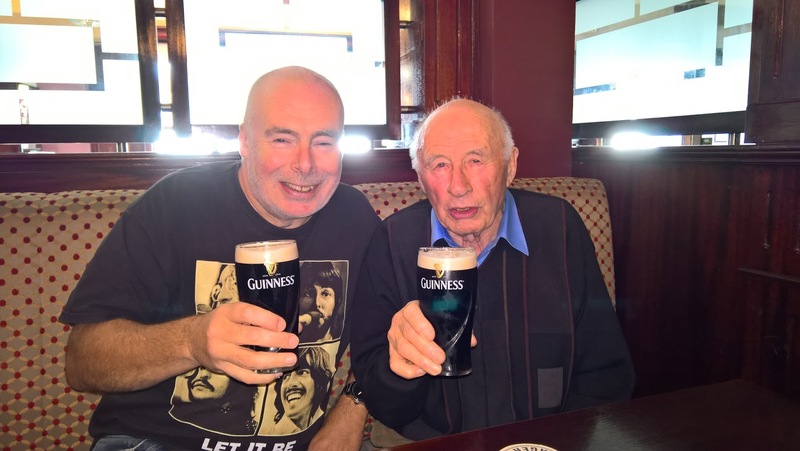 We both like our Guinness and I thought that a photo of the two of us would look great on my blog for today's post. We had a great chat about family, and as always Dad is great company and full of good cheer. Earlier we had been to see my Mum Phil in the Hermitage Clinic where she is recovering very well from a knee operation. Here we were also talking about family and she mentioned that her grandmother Margaret (Coburn) Byrne was a Protestant. Nothing at all wrong with that of course, but I never knew I was one eight "Protestant", having always assumed that all my ancestors were Catholic. Something to add to my family tree!